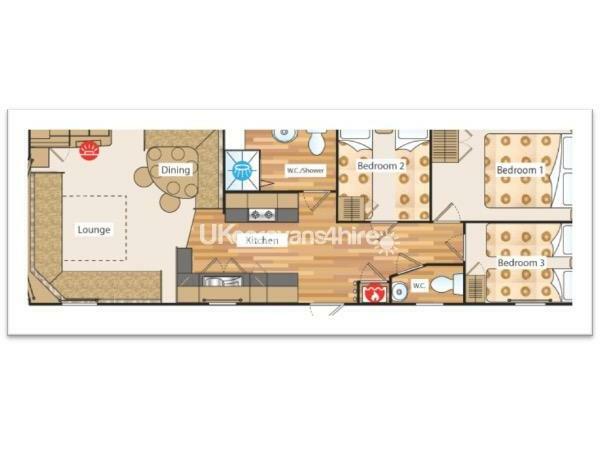 Additional Info: Our perfect caravan has a fully fitted kitchen, two toilets and 1 walk in shower. Our caravan is heated by a gas fire in lounge and the bedrooms have built in hot air heating. There is a pull-out double bed in lounge and a dining area. All bedding and covers are provided, gas and electric are included in the price. A vacuum and cleaning materials are provided for cleaning at your own convineince. Please supply your own towels etc. NB: Fun Park passes are not included in the price of the holiday. Please keep a copy of these T&Cs with you during your stay as they contain important information. a) The deposit must be paid within 7 days to confirm booking. Cheques are considered, but your holiday will not be booked until the cleared funds are showing in the bank. a) A deposit of £100 must be paid in full to secure the booking; £50 of this will be deducted from the holiday price. The other £50 is a security bond that is required against the caravan. c) In the event of cancellation the £100 deposit will not be refunded under any circumstances, unless cancelled by the caravan owner due to their inability to honour the booking. d) The security bond will be returned within 14 days after the caravan has been checked, unless, there has been a breach of any of the conditions by any of the guests. b) In the event that the holiday is not paid for in full 8 weeks before the holiday start date, your holiday will be will be cancelled and the dates released for re-sale. writing/email within 3 days. Any money owed to the guest will be returned within 7 working days from the date of receiving the first written/email notification. We will not accept social media or text messages to cancel any holiday. Arrange Travel Insurance – It is highly recommended that you arrange Travel Insurance to cover all guests. This will help protect you if you need to cancel your holiday. You must not tray and sell your holiday to someone else. Only those named on the booking form will be allowed in the caravan. This means that if you have to cancel you cannot sell the holiday to someone else. Do not arrive before the stated check in time (15:30) – You will be denied access, fined or evicted. The arrival time is there to allow for cleaning and to ensure everything is ready for your stay. Keep the caravan clean & secure – You have a responsibility to leave the caravan as you first find it. Prior to your stay the caravan should have been thoroughly cleaned. Always ensure that doors and windows are locked when you are not in the caravan and activate the alarm. * Please note: Haven Fun Park passes are not included in the price of the holiday; these can be purchased from reception on the day of arrival. If you have any specific requirements, pease can you also let us know. Welcome to Perfect Presthaven, A place to explore and take in the scenery. A resort to be active and entertained. A Holiday to make memories and be happy. Life as it Should be. We are so glad you are here; holidays are the times spent with families and loved ones. We want to make your next holiday a memorable one for all the right reasons. If you cannot find the answers you are looking for on our website, please get in touch, we will be extremely happy to help you and try and accommodate all of your holiday needs. After a busy day, our 2017 Abi Horizon allows for relaxation. With three bedrooms our caravans offer space for the practical needs of everyday life. The open-plan living space is deceptively spacious; the dining area will allow the family to come together for meals after you have cooked a feast in our modern kitchen. Location - Our caravan is perfectly set in the heart of Pesthaven Beach Resort. If you’re looking for an action packed weekend or just want to take a break, relax, read a book, our all rounded holiday experience will fulfil your desires. Presthaven is located in North Wales, a region passionate about its history, with magnificent castles and mountains, tumbling rivers and waterfalls and miles of sandy beaches and beautiful scenery. Whatever you choose to do, memories will be made, enjoyment will be fulfilled, a perfect holiday location for all. Price Range - From £100 per week (low season) to £850 per week (high season) *Haven Fun Passes are not included in the price of the holiday and these can be purchased from reception on arrival. Please contact us for the correct price at time of enquiry. If you have any questions, please get in touch, we want you to have the perfect holiday. Our beautiful 2017 Abi Horision, 8-birth caravan that is located on Conway 43 at Presthaven sands, just 5 minute walk away from the main complex. Double-glazed throughout, 3 bedrooms (1 double and 2 twin rooms) and a double bed settee in the living room. There is a gas fire in the living room and each bedroom has built in hot air blowers to keep you warm at night. There are two toilets within our caravan one of which has a walk in shower and a towel heater. The kitchen area has a gas cooker, microwave, toaster, kettle and an undercounted fridge with a top freezer. There is a vacuum and cleaning material for you to use at your convenience. We provide duvets, pillows and bed linen, we do not however provide towels so please bring your own. Gas and electricity are included in the price of your stay; the caravan is fitted with new smoke alarms, fire extinguisher and carbon dioxide monitors allowing you to feel safe when in the caravan, there is also an sensor alarm fitted within the caravan which can be turned on when you are leaving the caravan. The lounge area has a flat screen TV/DVD, gas fire and a dining area for you to relax in with your family and friends during the lazy comfy afternoons/evening, if you are not out and about visiting the lovely local attractions or Prestahven Beach Resort entertainment complex. To use the complex fun passes must be purchased from site reception on your arrival. The passes allow you to use the leisure facilities such as the swimming pools and also gain access to the amusement, bars and entertainment. 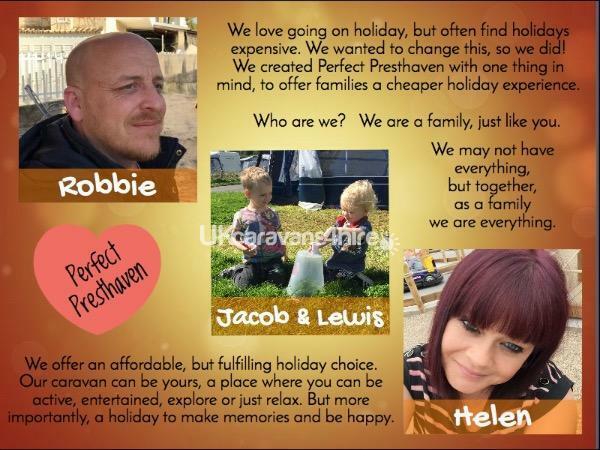 On site there is something for everyone to enjoy, so why not let us accommodate you in our caravan and let your holiday experience be with Perfect Presthaven, ‘Life as it should be’. Additional Info: Round-the-clock family fun from dawn until dusk. Young or old, rain or shine, there’s so much to keep you entertained during your time at Haven to ensure you have the perfect family holiday. You’ll never be short of things to keep you busy during your stay. Spend some time in the swimming pool or try some of the exciting activities we have available. The fun doesn’t stop when the sun sets, either, there's lots of evening entertainment, from bars and restaurants to stage shows, pantomimes and live music. Best of all, many of our activities are absolutely free, so there’s nothing to stop you from making the very best of your time at Haven. Pool activities - The pools aren’t just a great place to go for a swim, they’re also the home of loads of fun activities to keep your kids entertained throughout your holiday. From AquaJets to pool parties, there are all sorts of different ways to get some action on the water – in fact, there’s so much choice you won’t know which one to pick first! Aqua, Gliders, Aqua Jest, Junior Pool Party, Lear to swim, Pool Kayaking, Pool Party, Turbo Tablers, Water Confidence & Wter Wlakers. Sports - With a wide range of activities to choose from, we’ve got you covered whether you want to get involved in your favourite sport or try something more daring to get your heart racing. But we also have some activities intended to bring a smile to your face – perfect for making some happy holiday memories. Nature Rockz, Bush Craft - If you fancy being the next Bear Grylls, we have the perfect activities. From building a shelter to making a fire and finding out how to purify water, learn loads of exciting new outdoor skills! Water Purification, Survival Braclets, Fire Lighting Techniques & Survival Shelters. Daytime entertainment - Games and giggles galore. Kids love our daytime entertainment - from fantastic shows, interactive story experiences to hands-on activities where they can get involved with paint, glitter and even crazy science experiments and meet the Seaside Squad. Evening shows are a great time for everyone to get together for some family fun. Whether you want to show your moves on the dance floor, take in one of our incredible musical shows or get the whole family together for a quiz, we'll make sure your evening is one to remember! Early Evening - Buzz Live, Fun Stars Go Live, Go Tots, Go Win, Party Dances, Prize Bingo, Seaside Sqaud Adventurs, Seasid Sqaud Pop Concert. Late Evening - Visiting Acts and Shows. Food and drink - There’s so many places to find great food and drink at Presthaven. From mouth-watering meals at one of our bar and restaurants to traditional seaside fish and chips and takeaways you can enjoy in the comfort of your own holiday home. You’re never far away from a fresh cup of coffee or an indulgent ice cream. Mash & Barrell Restrunt, Fish & Chips Shop, Live Lounge, Carusel, Papa Johns, Burger King and the Main Shop. Hi Emma, thank you very much for your kind review and recommendation. We're very happy to read that your children loved it and you are hoping to come back in the summer. We would welcome you back any time. Many Thanks Rob & Helen. Hi Tracy, what a great review and your kind words are lovely. Helen and I are so very happy you had a nice time and we are so happy that you want to come back. You are welcome anytime. Looking forward to seeing you in 2020, thanks again Rob & Helen. Just spent 4 days in this caravan on a great site. The caravan is huge inside ( plenty of room for 6 adults who were all very impressed that it had 2 toilets ????) with everything you need for a self catering holiday. It is under 10 minutes from all the amenities and under 5 minutes from the beach. A very quick response from the owners every time I have messaged then regarding the booking and the booking procedure was very simple. Highly recommended. Thank you for your lovely comments Kimberley and we are very happy that you have rebooked. It really nice to hear that you had a great time and everybody enjoyed the break. Many Thanks Rob & Helen ???? We just had a fantastic 4 night break in this caravan. A very well presented and clean caravan. Well positioned for the amenities and the entrance yet still in a peaceful location. A good selection of toys for young children which us big kids enjoyed playing with too lol. A good range of dvds to cover all ages. A few personal touches made it feel like a home from home and the owners, Rob and Helen, went out of their way to make our Presthaven stay as perfect as possible. Great weather made it the perfect base to use the amenities or explore the local and not so local attractions. Looking forward to going back as soon as possible. Definitely a 5 Star rating!! Hi Tim and Maria, both Helen and I are very happy to read you had a great time and you are looking forward to coming back. We both really appreciate your feedback and thank you for your recommendation. Take Care Rob & Helen ???? Awww thanks Nadine for you feedback and kind words. We are so happy you had a nice time with your family. We hope to see you back again soon, take care, thanks again. Rob & Helen ???? What a lovely review Angela, we are so happy you had a great time. Thank you so much for your kind words and glad to hear you got home safe. Thanks for leaving the van so lovely and clean, Rob & Helen ???? After not being in a caravan for 2 years, we decided to go for a short break and let our new addition experience a caravan holiday. It was just lovely! Rob and his children (most well behaved ) met us on arrival and talked me through all the bits needed within the caravan. The van is absolutely lovely. Clean and spottless,bedding fresh and very home from home. Everything you need was there after a long drive and is in a fabulous spot. There are plenty of DVD choices and board games for the kiddies. A high chair which was a God send. A little park across the road... Rob was great at replying to questions and thankfully returning left items which the majority of private wouldn't do. I'm so grateful. The customer service was 10/10 from the minute I enquired to now still. We are thoroughly looking forward to booking a few more holidays with yourselves. Excellent and recommended. Thank you again you and Helen for renting to us. Just home from another great weekend away in this stunning caravan! 3rd time we've stayed here and again it did not disappoint! The caravan was as always spotless and so comfortable it really is a home away from home. It's great to know that your in a safe environment with lots to entertain little ones both in the caravan (games, dvds, building blocks all provided which is a lovely touch, thank you Rob) and a great play area to tire little legs just across the pathway! The views of a morning are stunning and just what you need when you want to forget about the world and take a few minutes out in your own little bubble! 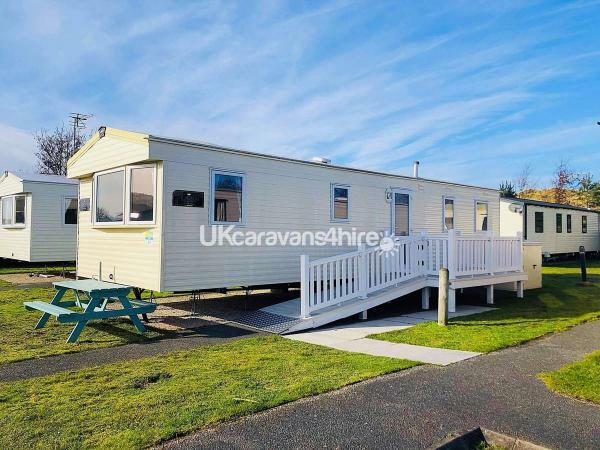 The caravan is in a perfect location just a few minutes walk from the pool, beach and entertainment centres which was great for us with a 3 and 4 year old to walk around with, we always have a fantastic time here and our two girls absolutely love it. (I was already asked on the way home if we can go the caravan again, so now as usual I'm looking I'm my diary to see when we can book again! Thank you so much for a fantastic break away which was well and truly needed and enjoyed by us all. wow Lidsay, what a lovely review! We are so thankfull for your kind words and rating and very happyto read that you have another gerat holiday. We hope to see you again very soon and you are welcome anytime. Take care, many thanks, Rob & Helen. Just come back from a week here. Thank you very much Rob and Helen for letting us stay in your beautiful van! I would definitely reccomended it. Amazing communication right from the start when i first enquired. The van is in a perfect location, right across from a little play area so you can see your kids playing. A 5 minute walk to the entertainment and swimming. The bed was sooo comfy and smelt amazing! We needed a hoover and Rob asked a friend of we could borrow his, it were dropped off within 10 minutes of Me asking. And we borrowed it again through the week, so thank you to the lovely man who borrowed it us too (-: we had a lovely time, we'll definitely be booking again, Thank you! Lovely caravan very clean, everything you need defiantly be staying again had a great time. Just got home today from a fabulous 4 nights in this beautiful caravan. It was so clean & tidy when we arrived and had everything we needed from start to finish! Cot and high chair was also provided! Would highly recommend! We had a fabulous time this week!!! So many activities for the kids. Caravan was immaculate and owners so easy to deal with. Highly recommended booking with them. Just got back from a lovely weekend here! Caravan was spotless, great spot on park, owners really easy to contact and easy to talk to! Will be 100% returning thankyou very much. Thank you for your lovely comments Lauren. We are very happy to hear you had a nice time and hoping to return. Your review is very much appreciated. Thanks again Rob & Helen. Just spent a few days in this caravan. Caravan looked just as it did on the pictures and was lovely and clean. Very thoughtful of the owners to leave various games and dvd's for children. I was impressed with the communication i recieved, everything was explained to me. Rob met us with the keys on arrival and was very welcoming. We enjoyed our stay and would recommend to a friend. Thanks Emma for your review, Helen and I always try to make sure our guest come first and reading your comments makes it all worth it. We hope to see you again in the near future. Many thanks again, Rob and Helen. We have stayed here twice & found the caravan spotless & comfortable. Thanks Sarah for you review and kind words. Hope to see you again next season. Helen & Rob. Thanks Lisa, we are very happy to here you will be back. Thanks for your review and nice words. Rob & Helen. Thanks Stephen, so happy you had a nice time and thanks you very much for you kind words. Hope to see you next season, Rob & Helen. All good caravan clean and tidy good people to deal with. Wow Leanne, what a lovely review and even giving it only halfway through your holiday. We are so pleased that you all having a nice time and hopefully get to meet you all Friday before you leave. We hope you do book again for 2018 and if you have a date in mind, please let us know. Thanks again, Rob & Helen. Just returned from a fabulous week at perfect presthaven. We went for my little boys second birthday he also loved every minute of it. Brilliant caravan, brilliant park. Thanks again. Just had a lovely weekend away in this caravan and I cannot recommend it enough. Rob and Helen are just the loveliest people and so helpful. The caravan is gorgeous and equipped with everything you need. Will be recommending to everyone! Hi Vicky, thanks so much for the lovely comments & 5 star rating, we are so happy that you all had a nice time in our caravan and we really hop eto see you again in 2018. Take care Rob & Helen. Stayed here for a long weekend last week. The caravan was great, lovely as clean and the owners very thoughtfully leave tea and coffee, a great selection of DVD's and some toys to entertain the kids - that's if you need to with the amount of stuff to do on the park. We thoroughly enjoyed our stay and will return again soon. Thanks Rob you guys have been extremely helpful and accommodating. Thanks Cheri, your kind comments mean a lot to us. We are very happy you all had a great time and look forward to seeing you again in 2018 hopefully. Many thanks again, Rob & Helen. Just returned from a Mon-Friday getaway and would highly recommend this caravan to anyone! It is very homely and welcoming when you first arrive, not to mention spotless! The caravan is a good size and has everything you might need whilst on holiday. We were provided with a travel cot and highchair for our Daughter and there was even toys and DVD's which was great! It is in a great spot and has beautiful views of the Welsh hills. The owner Rob was extremely helpful and very communicative. Overall, this was an excellent deal for the price, the beautiful caravan and the professional manner of the owners! Once again, would highly recommend!!! Fabulous caravan! Really modern, clean and tidy. Great location and the sun was across the front of the caravan all evening! Lots of added extras inside such as dvd's to watch and tea bags and coffee had been left for us to enjoy during our stay. The linen smelt lovely and clean and the whole place was really homely. The owners are really friendly and accommodating and if we had any queries they got back to us very quickly and couldn't help us enough. Would recommend to all. Many Thanks for a wonderful stay. Just returned from a lovely break away in this beautiful caravan. The caravan was spotless could not fault anything at all. They even provided a travel cot & high chair for my granddaughter. We found it like home from home with a good spacious bathroom with excellent shower and all the three bedrooms had plenty of wardrobe space. We also enjoyed the dvd's provided and the picnic bench outside in the sun. The caravan is in a good location on the resort looking out onto the the Welsh hills..what a lovely view to wake up to in the morning when you open the curtains! It's just a short walk to the entertainment & swimming pools. I shall return and highly recommend it since it was my daughters third visit which says it all. Thankyou! Aww thanks Jackie, we are so glad you had a nice time and your review is just lovely. Thanks so much, Rob and Helen. We are just back from a fantastic weekend at this caravan. What a brilliant time we've had. The caravan is beautiful. Spotlessly clean and the bedrooms all smelled of clean linen - my favourite smell! Loads of room for 4 adults and 4 children. Little touches were things like DVDS and games for the kids and the picnic bench outside. The site itself has everything you need for a perfect holiday. Will definitely be booking again next year. Thank you so much Rob for letting us hire from you. Brilliant. What a lovely review Katharine, it means so much to us when we see that our customers are happy and have had a great time on holiday. Thanks so much for your kind words and we will do hope to see you again next year. Rob & Helen. What a lovely review Jenna, both Helen & I are so glad Natalie & you had a nice time with your little ones. We hope to hear from you soon, in the hope that you will book with us again, until then, thanks again Rob & Helen. Aww thanks Melanie, we are so glad you all had a lovely time at the caravan and that everything was ok. Looking forward to seeing you again. Thanks Helen & Rob. "Perfect Presthaven " , that's what my short break was ,Absolutely perfect .Beautiful van in a great spot ! I could not fault a thing ,could have stayed for longer , so relaxing .Thanks Rob you were so helpful and kind .Will definitely book again . Just home from a fri-mon stay at this absolutely beautiful caravan, l would highly recommend. Caravan was immaculate, rob the owner was very professional and kept us well informed from start to finish, we will be booking to go back very soon. Amazing, kids loved it too. Perfect location, brilliant park for kids, couldn't ask for better from the owners...... Can't wait til we return next month! Just got back from a short brake at presthaven sands the caravan was so nice the owners are great and very helpful we loved it that much I have book to go again in June and July the prices are just amazing for how lovely everything is can't wait to go back the view from the caravan window in the morning is beautiful thank you for having us. Leah thanks for your kind words and thanks for booking again. Thanks Louie, so glad you enjoyed your stay and we hope this week is just as nice for you. So glad you all had a nice time Jessica, thanks for your lovely feedback and we hope to see you soon. Just back after a lovely weekend. Homely and clean caravan in a good spot. Owners are lovely and helpful. Will definately book again. Great location, beautiful clean caravan, great communication between owner and customer. Great information, would recommend 100%. Absolutely amazing break. The site is the perfect getaway for a nice relax and on site facilities are great. It is a place that caters for everyone. The caravan is modern and extremely well looked after and not a detail is missed. I thoroughly enjoyed my stay and will be going again. Thanks John for you great comments and review. We are happy that you have a great time and we hope to see you again in the near future. Rob & Helen. Lovely clean caravan, well equipt and reasonably priced. I would definitely recommend. Genuine people great prices would definitely recommend to anyone caravan is well equipped everything you need plus more. Thanks Lisa and Jordan, for your feedback and we are very happy to hear you had lovely break. Hope to see you again soon, Rob & Helen. Absolutely fab van .pristine accommodation. Sun all day at the front of the van .central location for all amenities . Great people to deal with . Fully equipped to excellent standard.no problem with my WiFi signal on my phone I'm on vodaphone.